31 A None No Power Seat 31 A is a standard Economy Class seat, however this seat may have restricted legroom due to the position of the bulkhead. The proximity to the lavatory and galleys may be bothersome. 31 C None No Power Seat 31 C is a standard Economy Class seat, however this seat may have restricted legroom due to the position of the bulkhead. The proximity to the lavatory and galleys may be bothersome. 31 D None No Power Seat 31 D is a standard Economy Class seat, however this seat may have restricted legroom due to the position of the bulkhead. The proximity to the lavatory and galleys may be bothersome. 31 F None No Power Seat 31 F is a standard Economy Class seat, however this seat may have restricted legroom due to the position of the bulkhead. The proximity to the lavatory and galleys may be bothersome. 31 G None No Power Seat 31 G is a standard Economy Class seat, however this seat may have restricted legroom due to the position of the bulkhead. The proximity to the lavatory and galleys may be bothersome. 31 H None No Power Seat 31 H is a standard Economy Class seat, however this seat may have restricted legroom due to the position of the bulkhead. The proximity to the lavatory and galleys may be bothersome. 31 J None No Power Seat 31 J is a standard Economy Class seat, however this seat may have restricted legroom due to the position of the bulkhead. The proximity to the lavatory and galleys may be bothersome. 31 L None No Power Seat 31 L is a standard Economy Class seat, however this seat may have restricted legroom due to the position of the bulkhead. The proximity to the lavatory and galleys may be bothersome. 34 A None No Power Seat 34 A is a standard Economy Class seat however, this seat is missing a window. 34 L None No Power Seat 34 L is a standard Economy Class seat however, this seat is missing a window. 47 A None No Power Seat 47 A is a standard Economy Class seat, however, this seat may have limited recline and the proximity to the lavatories may be bothersome. 47 C None No Power Seat 47 C is a standard Economy Class seat, however, this seat may have limited recline and the proximity to the lavatories may be bothersome. 47 D None No Power Seat 47 D is a standard Economy Class seat, however other flyers tend to bump into this seat. 47 H None No Power Seat 47 H is a standard Economy Class seat, however other flyers tend to bump into this seat. 47 J None No Power Seat 47 J is a standard Economy Class seat, however, this seat may have limited recline and the proximity to the lavatories may be bothersome. 47 L None No Power Seat 47 L is a standard Economy Class seat, however, this seat may have limited recline and the proximity to the lavatories may be bothersome. 48 D None No Power Seat 48 D is a standard Economy Class seat, however, this seat may have limited recline and the proximity to the lavatories may be bothersome. 48 F None No Power Seat 48 F is a standard Economy Class seat, however, this seat may have limited recline and the proximity to the lavatories may be bothersome. 48 G None No Power Seat 48 G is a standard Economy Class seat, however, this seat may have limited recline and the proximity to the lavatories may be bothersome. 6 A None No Power Seat 6 A is a standard Business Class seat, however the proximity to the galleys may be bothersome. 6 C None No Power Seat 6 C is a standard Business Class seat, however the proximity to the galleys may be bothersome. 6 D None No Power Seat 6 D is a standard Business Class seat, however the proximity to the galleys may be bothersome. 6 H None No Power Seat 6 H is a standard Business Class seat, however the proximity to the galleys may be bothersome. 6 J None No Power Seat 6 J is a standard Business Class seat, however the proximity to the galleys may be bothersome. 6 L None No Power Seat 6 L is a standard Business Class seat, however the proximity to the galleys may be bothersome. 61 D None No Power Seat 61 D is a standard Economy Class seat that has extra legroom, however the proximity to the lavatories may be bothersome. 61 F None No Power Seat 61 F is a standard Economy Class seat that has extra legroom, however the proximity to the lavatories may be bothersome. 61 G None No Power Seat 61 G is a standard Economy Class seat that has extra legroom, however the proximity to the lavatories may be bothersome. 61 H None No Power Seat 61 H is a standard Economy Class seat that has extra legroom, however the proximity to the lavatories may be bothersome. 62 A None No Power Seat 62 A is a standard Economy Class seat that has extra legroom, however the proximity to the lavatories may be bothersome. 62 C None No Power Seat 62 C is a standard Economy Class seat that has extra legroom, however the proximity to the lavatories may be bothersome. 62 J None No Power Seat 62 J is a standard Economy Class seat that has extra legroom, however the proximity to the lavatories may be bothersome. 62 L None No Power Seat 62 L is a standard Economy Class seat that has extra legroom, however the proximity to the lavatories may be bothersome. 69 D None No Power Seat 69 D is a standard Economy Class seat, however other flyers tend to bump into this seat. 69 H None No Power Seat 69 H is a standard Economy Class seat, however other flyers tend to bump into this seat. 70 D None No Power Seat 70 D is a standard Economy Class seat, however this seat may have restricted legroom due to it being misaligned with the row in front. 70 F None No Power Seat 70 F is a standard Economy Class seat, however this seat may have restricted legroom due to it being misaligned with the row in front. 70 G None No Power Seat 70 G is a standard Economy Class seat, however this seat may have restricted legroom due to it being misaligned with the row in front. 73 A None No Power Seat 73 A is a standard Economy Class seat that has limited recline and the proximity to the lavatories and galleys may be bothersome. 73 C None No Power Seat 73 C is a standard Economy Class seat that has limited recline and the proximity to the lavatories and galleys may be bothersome. 73 D None No Power Seat 73 D is a standard Economy Class seat, however the proximity to the lavatories may be bothersome. 73 G None No Power Seat 73 G is a standard Economy Class seat, however the proximity to the lavatories may be bothersome. 73 L None No Power Seat 73 L is a standard Economy Class seat. 74 D None No Power Seat 74 D is a standard Economy Class seat that has limited recline and the proximity to the lavatories and galleys may be bothersome. 74 F None No Power Seat 74 F is a standard Economy Class seat that has limited recline and the proximity to the lavatories and galleys may be bothersome. 74 G None No Power Seat 74 G is a standard Economy Class seat that has limited recline and the proximity to the lavatories and galleys may be bothersome. 74 J None No Power Seat 74 J is a standard Economy Class seat that has limited recline and the proximity to the lavatories and galleys may be bothersome. 74 L None No Power Seat 74 L is a standard Economy Class seat that has limited recline and the proximity to the lavatories and galleys may be bothersome. 9 A None No Power Seat 9 A is a standard Business Class seat, however the proximity to the galleys may be bothersome. 9 C None No Power Seat 9 C is a standard Business Class seat, however the proximity to the galleys may be bothersome. 9 D None No Power Seat 9 D is a standard Business Class seat, however the proximity to the galleys may be bothersome. 9 H None No Power Seat 9 H is a standard Business Class seat, however the proximity to the galleys may be bothersome. 9 J None No Power Seat 9 J is a standard Business Class seat, however the proximity to the galleys may be bothersome. 9 L None No Power Seat 9 L is a standard Business Class seat, however the proximity to the galleys may be bothersome. Audio entertaiment on this plane is available in all classes via the seatback touch screen. Every seat on this aircraft has a personal entertaiment system with a variety of over 50 movies, interactive games and streaming music. Power ports are available at all Business class seats and between each seat in Economy class. 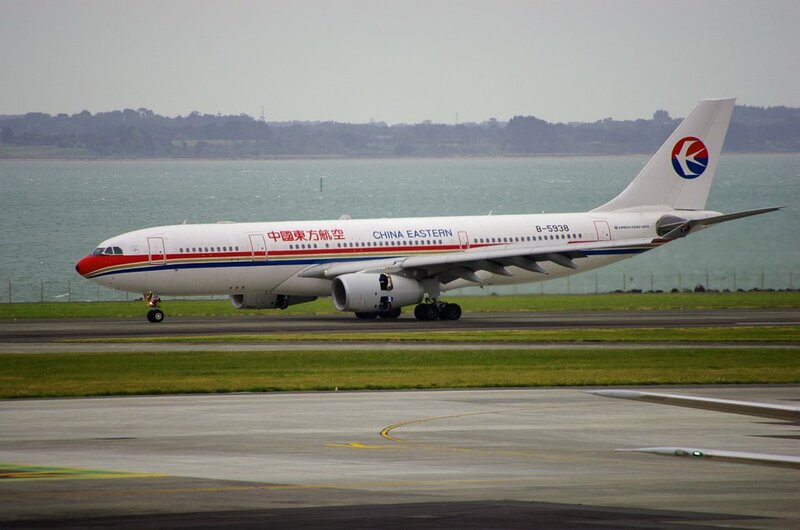 China Eastern offers Chinese food and other western-style food along with beverages and liquors. This aircraft has two different classes- Business and Economy Class. The aircraft seats 264 passengers in a two-class layout with 240 passengers in Economy and 24 in Business class. I was on 31J. I definitely like the leg room on my seat. Also, it had great views due to it being a window seat. Since it is the first row of economy, you are the first to be served. It also has close proximity to the comfort room. It can get noisy when they prep for the meal service. The seat itself needs an upgrade because I've rode on their other A330s and they had better cushion on the seats and are very comfortable so it definitely needs a refurbishment. The TVs here are shared by the way not like the other A330s. The seat was relatively comfortable and the 2-4-2 seating certainly helps make these aisle seats feel less cramped. The IFE is a bit older and suffers from the problem of passengers having to push hard on the screen, disturbing to the person on the other side.